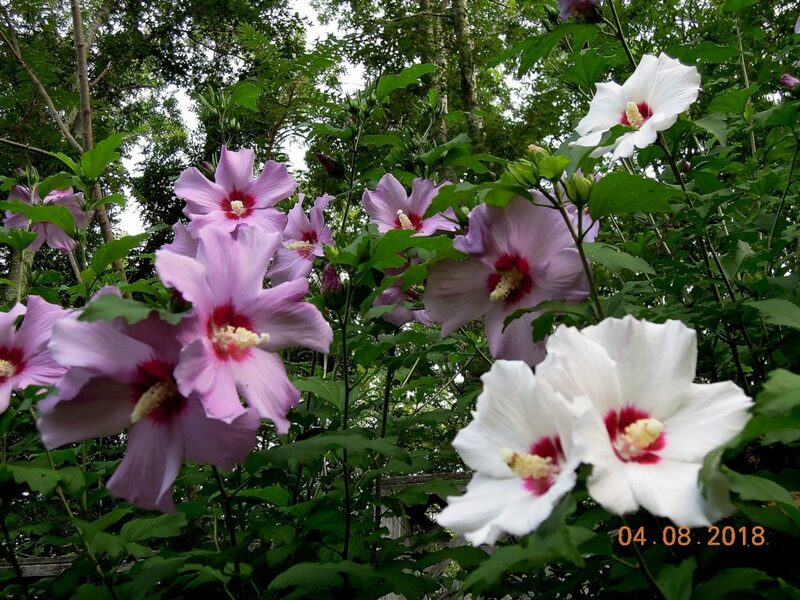 Late summer is prime bloom time for Rose-of-Sharon (Hibiscus syriacus zones 5-8). 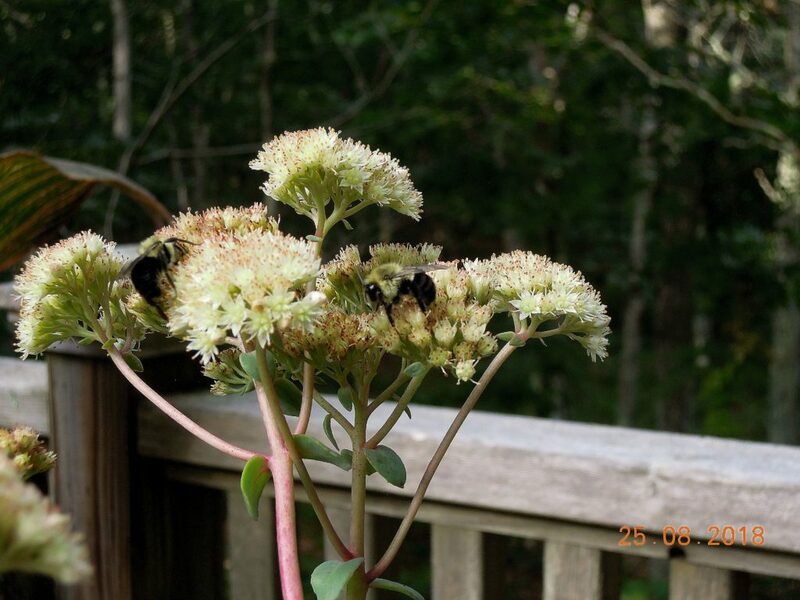 My hardy shrubs are beloved by bees and hummingbirds and flower from early August thru September in varying shades of white, pink and purple. They never disappoint. Photo below. Hylotelephium telephium ssp. 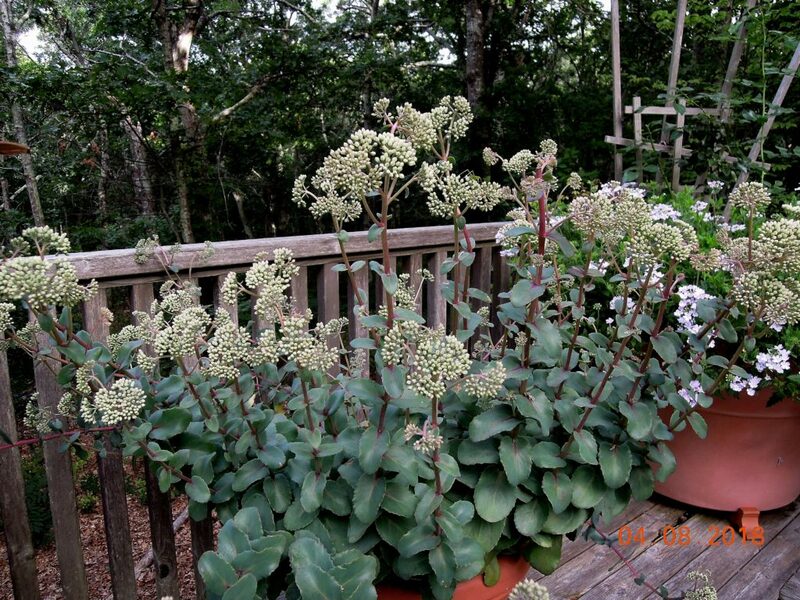 ruprechtii ‘Hab Gray’ (aka Sedum telephium ssp. ruprechtii ‘Hab Grey’) Quite a mouthful. It must have been a slow day in taxonomy land when the plant was christened. Defined by all that hoity-toity Latin, one might expect a demanding, pampered aristocrat. Hab Gray is anything but. 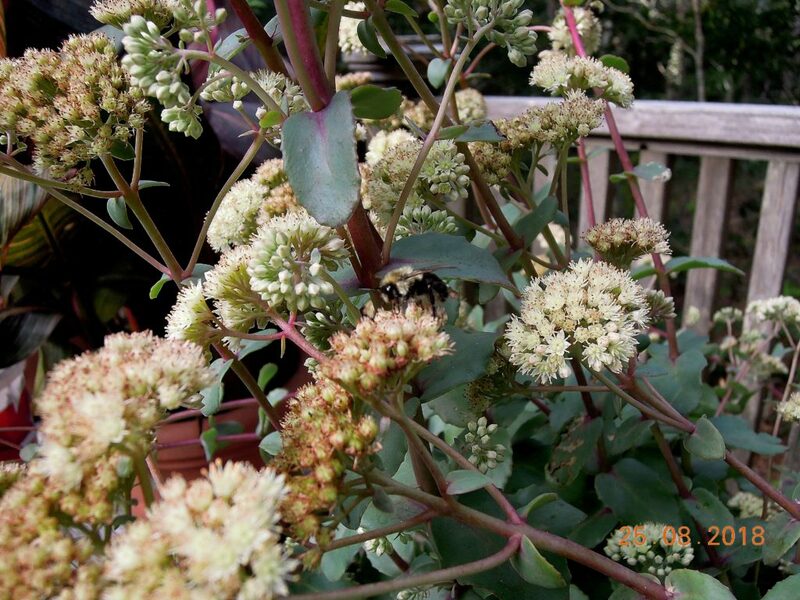 This hardy herbaceous perennial has showy, succulent, gray-green foliage adorning 12-14 inch pink stems, and in late summer produces dense clusters of small, white, star-like flowers, magnets for butterflies and bees. Photos below. Hab Gray is drought tolerant and will succeed in zones 4-8 in well-drained, low-fertile soil. My plant has flourished for 15 years in an outdoor container. At the onset of winter, I cover the plant with conifer branches and store it under an outdoor bench until Spring. In the ground, it’s an ideal plant for a rock garden or for the front of the border. Finally, Hab Gray has an additional asset: A detached leaf rooted in soil will form a new plant — perfect for gifts, garden club plant sales or classroom/home projects with children. No surprise that Monsanto—the producer of Roundup, the most popular herbicide containing glyphosate –and the manufacturers of the tainted cereal say that their products meet federal standards and the glyphosate in the food does not exceed levels set by the federal Environmental Protection Agency (EPA). That’s a joke. This is the very same Trump EPA that is trashing all reasonable and essential health and safety regulations and standards in the name of deregulation in favor of Big Business. (See post, “Jan/Feb. 2018: Toxic Chemical Alert”). I no more trust Trump’s EPA than I trust Monsanto. Besides, a pox on EPA’s acceptable levels of poison! I don’t want to eat ANY toxic glyphosate. Or feed it to my family. Or feed it to anyone else for that matter. This entry was posted on September 11, 2018, in Autumn Fruit and Color, Flowering Shrubs, Organic Gardening, Trees and Shrubs. Bookmark the permalink.